I am totally obsessed with the “Outlander” series of novels by Diana Gabaldon as much as I am about food and cooking. As with all of the books, the types of foods eaten by the fictional characters are often mentioned and in the 7th novel in the series, “An Echo In the Bone” mentions Scotch eggs in Chapter 74. I have seen them before and they reminded me of a meatloaf with a boiled egg encased in ground meat. I never tried one, but after seeing them occasionally on cooking shows and eventually reading the Outlander books, my culinary curiosity went into overdrive……. The London department store Fortnum & Mason claims to have invented Scotch eggs in 1738, but they may have been inspired by the Mughlai dish nargisi kofta or “Narcissus meatballs” once served from the Imperial Kitchens of Maharajas of India and were are composed of minced or ground meat—usually beef, pork or lamb—mixed with spices and/or onion. For the most part, koftas are still a popular dish in Afghan, Arab, Indian,Palestinian, Iranian, Jordanian, Kurdish, Moroccan, Pakistani, Romanian, Lebanese, and Turkish cuisines. 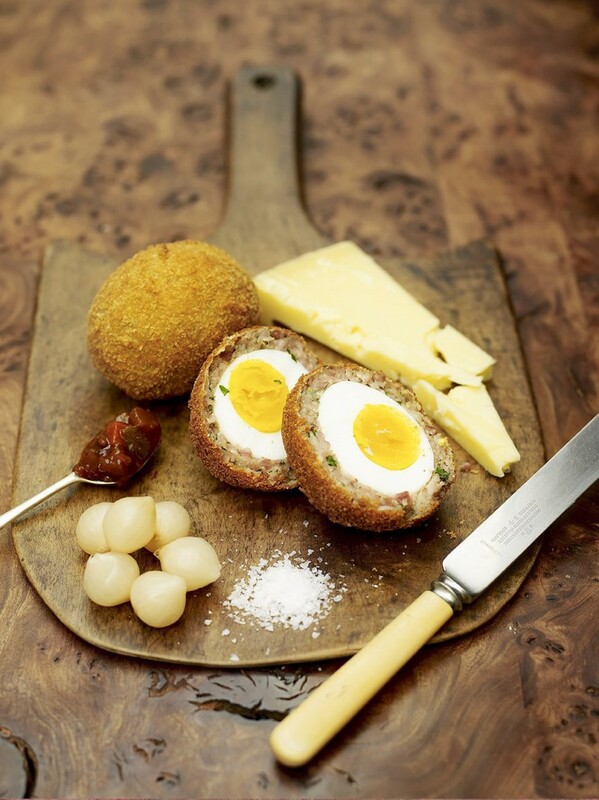 Given the origins of the Scotch egg, it would have most likely been influenced by Indian cuisine, since The British first arrived in India in the early 1600s and soon established trading posts in a number of cities under the control of The East India Company. By 1765 the Company’s influence had grown to such an extent that the British were effectively controlling most parts of the country. The earliest printed recipe for Scotch eggs first appeared in the 1809 edition of Mrs. Rundell’s A New System of Domestic Cookery. Mrs. Rundell—and later 19th-century authors—served them hot, with gravy. In these modern times, Scotch eggs are a common picnic food. In the United Kingdom packaged Scotch eggs are commonly available in supermarkets, corner shops and motorway service stations. Miniature versions are also widely available, sold as “savoury eggs”, “picnic eggs”, “party eggs”, “snack eggs”, “egg bites” or similar. These contain chopped egg or a quail’s egg, rather than a whole chicken egg, and sometimes contain mayonnaise or chopped bacon. In the United States, many “British-style” pubs and eateries serve Scotch eggs, usually served hot with dipping sauces such as ranch dressing, hot sauce, or hot mustard sauce. At the Minnesota State Fair Scotch eggs are served on a stick. Scotch eggs are available at most Renaissance Festivals from Maryland to Texas. Not fully committed to using full sized chicken eggs, I opted to use quail eggs for this recipe. And I must say, the results were spectacular! Fill a pot two-thirds full of water and bring to a gentle boil. Gently add the quail eggs. Do not over crowd the pot and continue to boil for 4 to 5 minutes for hard boiled eggs. Remove the eggs from the boiling water with a slotted spoon and immediately plunge into ice cold water. Peel when cold. Put the sausage meat into another bowl with the herbs, paprika,a good grating of nutmeg, and a good pinch of salt and pepper.Gently mix until combined.Divide sausage into 12 equal portions. Place flour in a wide shallow bowl and panko in another wide shallow bowl. Pat 1 portion of sausage into a thin patty over the length of your palm. Lay an egg on top of sausage and wrap sausage around egg, sealing to completely enclose. Repeat with remaining sausage and eggs. Whisk your large egg in a medium bowl to blend. Working gently with 1 sausage-wrapped egg at a time, dip eggs into flour, shaking off excess, then coat in egg wash. Roll in panko to coat. Place the coated eggs on a plate and store in the refrigerator, uncovered for 1 to 2 hours. Attach a deep-fry thermometer to side of a heavy pot. Pour in oil to a depth of 2 inches and heat over medium heat to 375°F. Fry eggs, turning occasionally and maintaining oil temperature of 350°F, until sausage is cooked through and breading is golden brown and crisp, 5 to 6 minutes. Use a slotted spoon to transfer eggs to a baking sheet lined with paper towels to drain. Season lightly with salt and pepper. Serve warm with mustard. This entry was posted in Appetizers/Starters, Brunch, Snacks and tagged Chives, English, Mustard, Nutmeg, Outlander, Panko Breadcrumbs, Parsley, Quail Eggs, Sage, Sausage, Sweet Paprika. Bookmark the permalink.